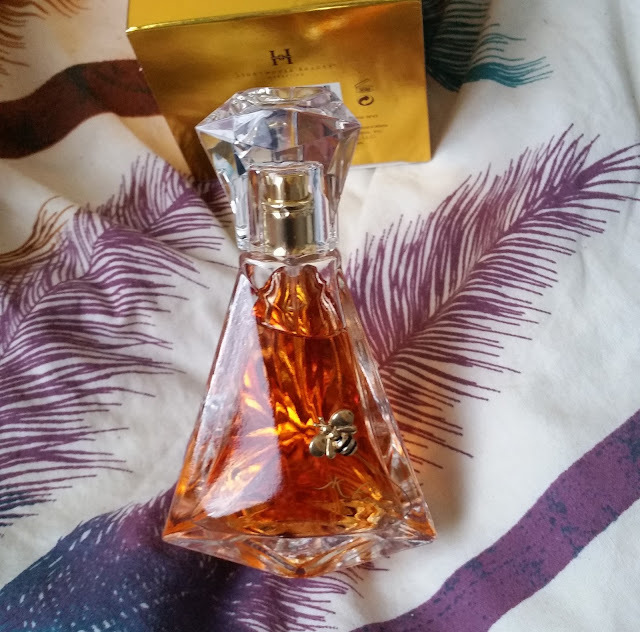 I was really excited to receive this Perfume to review, as i have not previously owned a Kim Kardashian scent but have heard she has a range of scents to her name. The Pure Honey box plays on the "Honey" theme and expresses itself with gold and yellow hues. The sleeve over the box features Kim with a picture of the bottle, but on the side of the sleeve and the box, it has textured pictures of bee's and honey cones, adding and playing on the "Bee" theme. When u take the sleeve off the box it features the KK trademark and Kim Kardashian blazoned on the front with an added picture of a honey bee. The bottle is stunning with its art deco shape and with the scent being an amber colouring, this will look stunning on anyones shelf or dresser. There is also a golden bee on the front of the bottle with KK Pure Honey underneath the bee, but you don't have to have this showing as the bottle looks the same from any angle when placed on any surface. The gold spray head and clear cap help this bottle stand out and be unique from any other bottles in your collection. "Pure Honey by Kim Kardashian is an irresistible floral gourmand evoking her endless allure with its intoxicating honey and voluptuous florals. A fragrance as radiant and golden as the woman who created it. Feminine, Enticing, Heavenly... Experience delight of pure honey." The scent opens up with a lovely note of pure honey then settles down to a floral bed, with a hint of vanilla and musk. It is not overly sweet nor sickly sweet, but a lovely soft and warm inviting aroma that will have u smelling your wrist in wonder! Pure Honey is a very unique scent that is really different and sets itself apart from the same generic "Sugar Bomb" celebrity scent you can buy. The scent sits close to the skin but you will be reminded of its presence throughout the day or when u choose to use it. A beautiful, unique scent, that will transport you outside with the sun shining from its aroma of pure honey. X Neil.